A quick reminder for anyone new to the series, Tribal Tuesday is all about checking out some of the overlooked tribes in magic history and having some fun brewing in different formats. With that out of the way, let’s get onto the Kobolds! Kobolds joined the magic universe way back in Legends in 1994, being described as a cross between a goblin and an imp, Teferi even compared them to cockroaches as they’ve managed to survive in the well-known uninhabitable ‘Kher Keep’, unafflicted by the disasters that ravaged the other parts of Dominaria. With our Giants last week having a defining trait of being big creatures with a high converted mana cost, Kobolds have a surprising trait being that the majority of them cost 0 and have 0 power and 1 toughness. Now, I know what you’re thinking, why am I writing an article about a ton of 0/1 creatures? (I’m also thinking this) But it turns out, you can actually make these guys work in some hilarious ways! While I could go the route of going full tribal trying to play as many Kobolds as I could squeeze into my 60 card deck, legacy just isn’t the format for that and whilst I did make a list of just that (http://tappedout.net/mtg-decks/full-tribal-kobolds/) It’s not the route I decided to go in the end. In this deck, we actually take advantage of the Kobold’s trait of having 0 CMC and use it to essentially ‘storm off’. Using the card ‘Glimpse of nature’, a card so good it’s banned in modern, to continually play 0 costing Kobolds (and a few other non-Kobold creatures, hmm.. should this be tribal Tuesday – 0cmc?) draw a card, and play other 0 CMC Kobolds, we can build up a massive storm count and bushwhack our way to victory as early as turn 1! One of the most important aspects of this deck is the mana, and that might seem strange with a deck that only runs 7 lands, but in order to get our crazy turn one wins we need to be able to generate multiple amounts of mana in a single turn. In the deck, we have 6 Spirit Guides, 1 Tinder Wall, 4 Lotus Petal, 1 Mox Opal, and in a weird way 2 Crop Rotations, all with the purpose of generating extra mana. Not 100% with us? Let me try and break it down step by step. An ideal opening hand would include; at least 1 Glimpse of Nature, 1 land (preferably Glimmervoid), 1 Lotus Petal or Spirit Guide and a number of Kobolds. On our first turn, we drop a land, tap it for green and play our Glimpse of Nature and start dropping Kobolds. We have a total of 22 ‘Kobolds’ in the deck so as we play one and draw off of Glimpse of Nature the odds are in our favour of drawing another and hopefully draw into another Glimpse of nature, at this point, we drop either a Lotus Petal or an Elvish Spirit Guide giving us another green mana to play the card. We really start cooking now as every Kobold we play draws us two cards, reducing the chances of fizzling. Once we’ve drawn the majority of our deck, with enough creatures in play, we can either surge in a Bushwacker giving our Kobolds attacking power or play Haze of rage for an insane storm count with all the creatures we’ve played in a single turn, and swing for lethal. The deck comes with a ton of redundancy to help the combo. 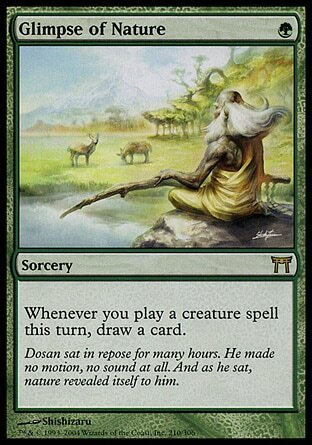 Playing 4 ‘Beck/Call’ act as another 4 copies of Glimpse of Nature to continue the card draw engine. Need a bunch of green mana all at once? Cast a Crop Rotation and go find yourself a Gaea’s Cradle and tap that sucker for a ton of mana with all the creatures we’ve got in play. Starting to run dry on Kobolds? Sacrifice a single one to ‘Scapegoat’ and start all over again with your recently bounced-back creatures. Can’t swing in for lethal for some reason? Ensnaring bridge shutting down your Haze of rage plan? Impact Tremors allows us to win without the combat step, and whilst this is slightly harder to do in a single turn, it’s still possible. Overall, this deck seems absolutely crazy, janky and hilarious all in one go which makes it a perfect Tribal Tuesday deck. So what do you guys think of ‘Kobold Storm’? Had you ever heard of Kobolds before now? Anything I missed? And as always, what tribe should we cover next, got any underloved favourites? Let us know! Previous Post So Guilds of Ravnica Didn’t get Charms? Next Post So you’re thinking of getting back into Standard.